S leep is vital to your teens’ overall well-being, as important as the air they breathe, the water they drink, and the food they eat. It can even help your child eat better and manage the stress of being a teen. 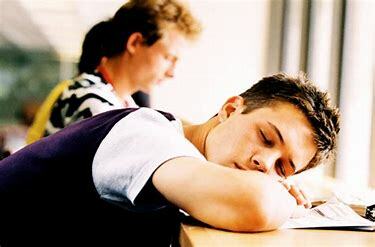 Biological sleep patterns shift toward later times for both sleeping and waking during adolescence, meaning it is natural to not be able to fall asleep before eleven o’clock. Most teens need about eight and a half to nine hours of sleep each night in order to function optimally. The majority of teens do not get enough sleep. Teens tend to have irregular sleep patterns throughout the week, typically staying up late and sleeping in late on the weekends, which can affect their biological clocks and hurt the quality of their sleep. Many teens suffer from treatable sleep disorders, such as narcolepsy, insomnia, restless legs syndrome, or sleep apnea. cause the teen to drive while drowsy. Make sleep a priority. Decide what you or your teen needs to change in order for him or her to get enough sleep to stay healthy, happy, and smart. Naps can help pick your teen up and make him or her work more efficiently—if you plan them right. Naps too long or too close to bedtime can interfere with regular sleep. Keep your teen’s room cool, quiet, and dark. If you need to, buy eye-shades or blackout curtains. Let in bright light in the morning to signal the body to awaken. No pills, vitamins, or drinks can replace restful sleep. Consuming caffeine close to bedtime can impair sleep, so your teen should avoid coffee, tea, soda, and chocolate late in the day in order to sleep at night. Nicotine and alcohol also interfere with sleep. Don’t allow your teen to leave homework for the last-minute. Try to avoid the TV, computer, and telephone in the hour before bed. Sleep deprivation has the same impairment as driving with a blood alcohol content of .08 percent, which is illegal for drivers in certain states. Drowsy driving causes over 100,000 crashes each year. Make sure your teen can recognize sleep deprivation, and encourage him or her to call someone else for a ride. Establish a bedtime and wake-time pattern and stick to it, coming as close as you can on the weekends. A consistent sleep schedule will help your teen feel less tired since it allows the body to get in sync with its natural patterns. You will find it easier for him or her to fall asleep at bedtime with a routine. Have your teen do the same things every night before going to sleep in order to teach the body the signal of bedtime. For example, have your teen take a bath or shower to help him or her relax. This could also free up extra time in the morning. Most teens experience changes in their sleep schedules. Their internal body clocks cause them to fall asleep and wake up later. It is hard to change the habit, so you must find what works best for your teen. Make sure activities at night are calming in order to counteract the already heightened alertness. For more information on teen issues, pick up your copy of my book Teens Dodging Bullets.